We have a winner!! - Stop staring and start sewing! Well today I (well, my trusty assistant) got to draw the name for the winner of the 4 piece custom set made from my precious stack of Freshcut fabric. I've been so excited with anticipation that it has actually kept me up at night (I know, don't say it). December was a crazy month for having a contest but it was lots of fun and I really appreciate everyone who placed a bid. I owe a huge thanks to Heather Bailey for her generosity in providing the Trash Ties for all of the winners! Let me know what you think of them (I know you'll love them!) and be sure to take lots of pictures because there could be a contest coming up over yonder at Trash Ties Central (but you didn't hear it from me). There were a total of 305 bids for all of my December auctions (I know, Wow!). 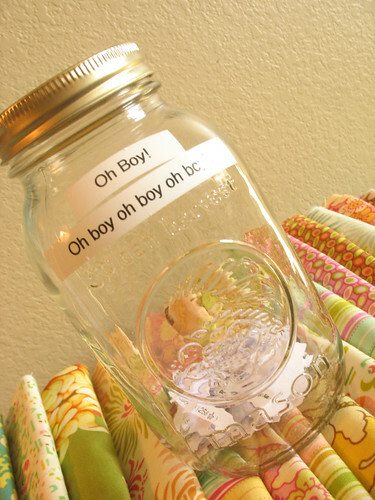 I placed each bid in this mason jar and gave it many shakes. I then handed it to my assistant who gave it many shakes (too many in my opinion but I'm just grateful he didn't drop it on the tile). 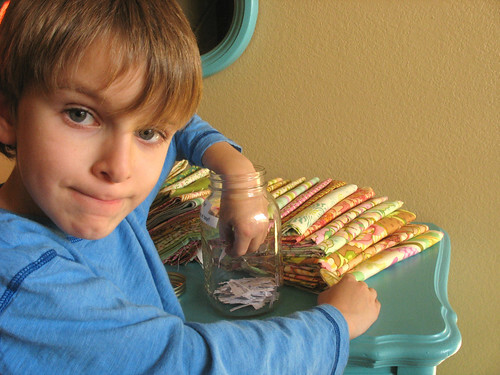 Here's my steady-handed and entirely objective assistant doing his job (the winner may want to send a little lollipop his way, he really worked hard) ;) See, he's got the winning name right there between his finger and thumb. 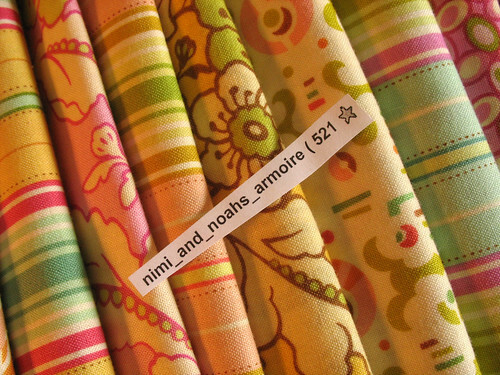 And the winner is......Kelly (known on ebay as "nimi_and_noahs_armoire")!! Congratulations Kelly!! We'll talk!